Loving Downtown so much you’d like to stay the night? There's so much to do in Downtown Louisville. Start Exploring! Old and new combine in exciting ways in Louisville’s downtown offering something for everyone from the original Whiskey Row to the emerging arena district to the 10 walkable attractions in the four blocks of Museum Row. 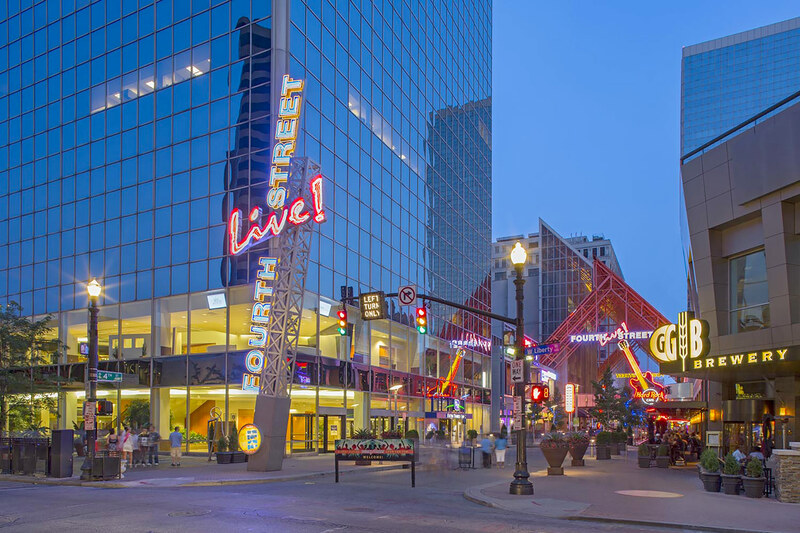 With its unique streetscape program and a collection of museums and cultural institutions celebrating such icons as Muhammad Ali and the Louisville Slugger, West Main Street has become a true destination. Both residents and visitors alike enjoy its vitality and creative energy, from its 120 foot bat to the red penguins roaming its rooftops. Louisville's West Main Street, with its extraordinary collection of Victorian cast-iron historic facades combined with striking contemporary architecture, has experienced a dramatic renaissance over the past decade, and has become one of the most creative arts-inspired cultural districts in the nation. Quickly becoming known as “Museum Row,” downtown’s West Main Street is home to nearly 10 local attractions in one historic neighborhood, located a block south of the Ohio River. These must-see attractions include the Louisville Slugger Museum & Factory, Muhammad Ali Center, Frazier History Museum, Kentucky Science Center and more. Bourbon enthusiasts will enjoy the Evan Williams Bourbon Experience and this area will also be the home of Michter's Distillery. Art lovers will enjoy: Glassworks, KMAC, 21c Museum Hotel and The Kentucky Center for the Performing Arts. You’ll be pleasantly surprised to find Louisville’s Museum Row is housed in America’s second largest collection of cast-iron facades. (See for yourself by placing a magnet on one of the buildings.) Only New York City’s SoHo district has more 19th century cast-iron storefronts. Once the residential address of prominent merchants, Fourth Street became downtown’s primary retail, corporate and entertainment corridor throughout the 19th and 20th centuries. Stretching from the Ohio River, south to Broadway, these seven blocks have seen a dramatic transition through the years – from pastoral to residential use, followed by rapid commercial growth, urban decay and now sweeping revitalization. Just south of Broadway you’ll discover one of the city’s nine Carnegie Libraries. Built between 1906 and 1908 the Louisville Free Public Library Main Branch’s grounds were also designed by famed landscape architect Frederick Law Olmsted. Fourth Street has again become the place for generations of diners, shoppers, theater-goers and urbanites to see and be seen. The avenue houses the city’s two grand, historic hotels – the Brown and the Seelbach – each famous in their own right. 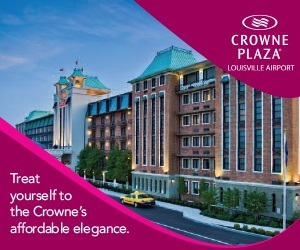 The 304 room Embassy Suites Downtown is a modern hotel housed in the former historic Stewart’s Dry Goods Building and is listed on the National Register of Historic Places in Louisville. At the Ohio River is the city’s only riverfront hotel, and one of the southeast’s largest with 600 spacious suites and 700 guest rooms – the Galt House Hotel & Suites. Check out a show at the historic Louisville Palace. Opened in 1928, the theatre is a lavish Spanish Baroque Revival style with fountains, statues and tapestries. In the foyer, the “Ceiling of Celebrities” contains 141 medallion faces of famous men, including the Palace’s architect John Eberson. Enjoy the tried-and-true traditions at one of the many established downtown restaurants or enjoy one of the new eateries at Fourth Street Live! The $70-million entertainment district has revitalized downtown, adding a variety of restaurants and entertainment venues, and reconnecting the city’s riverfront to its main east/west thoroughfare, Broadway. Each month, the Republic Bank First Friday Hop ties Historic West Main Street and its galleries to the flourishing visual art galleries of the NuLu area. Take in this Louisville original – the downtown Art Zone starting at 5 PM on the first Friday of every month. A free ZeroBus (zero-emission electric bus) circulates between the two districts; check out www.galleryhop.org for more details.